My research with Timema walking-sticks focuses in understanding various aspects of their evolutionary history and ecology, and, in particular, their relationship with their food plants and predators. All species in this group are wingless herbivores and are restricted to western US. They have a 20,000,000 year history in this country and have primarily conquered the chaparral habitat. 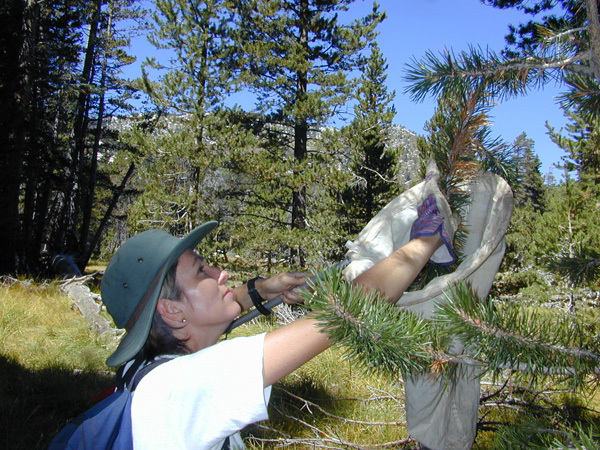 Cris Sandoval searching for Timema walking-sticks in San Jacinto Mountain peak, 10,000 feet elevation. One of my interests is to understand how the spatial distribution of host plants affects the balance between gene flow and natural selection. 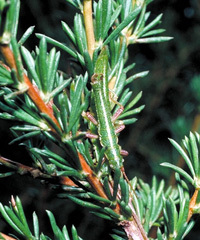 Host plants such as chamise and ceanothus impose a number of different selective pressures that foster adaptive genetic variation in local populations of walking-sticks. 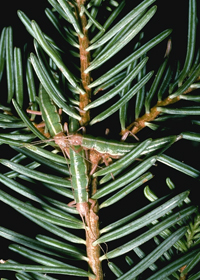 When host plant patches occur isolated from others, little migration of walking-sticks occur between patches. When a patch of chamise connects to a patch of ceanothus, migration, and consequently gene flow, may occur between the local populations of walking-sticks. 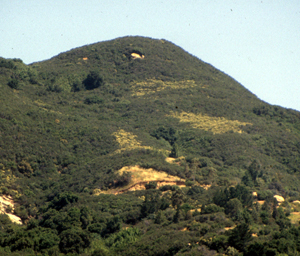 The chaparall is the most common habitat for Timema species. This picture of the Santa Ynez Mountains was taken at the end of Spring. Three patches of chamise, Adenostoma fasciculatum, can be easily distiguished from other vegetation by the white flowers. Note, proper species identification requires verification of the male and female genitalias. T. californicum, Mt. Hamilton T. californicum, Cuesta Ridge T. cristinae, striped morph, Santa Ynez Mt. 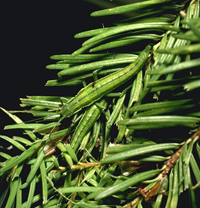 T. cristinae, unstriped morph, Santa Ynez Mt. 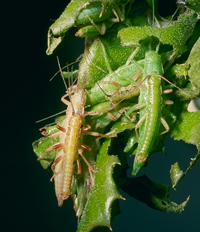 Sandoval, C. P. and Crespi, B. Adaptive evolution of cryptic coloration: the shape of host plants and dorsal stripes in Timema walking-sticks. (accepted in Biological Journal of the Linnean Soc.). Nosil, P, Crespi, B.J., Sandoval, C.P., and Kirkpatrick, M. 2006. Migration and the genetic covariance between host preference and performance. American Naturalist 167:E66-E78. Nosil, P, Sandoval, C.P. and Crespi, B. 2006. The evolution of host preference in allopatric vs. parapatric populations of Timema cristinae. Journal of Evolutionary Biology 19:929-942. Sandoval, C. P. and Nosil, P. 2005. Counteracting selective regimes and host preference evolution in ecotypes of two species of walking-sticks. Evolution 59:24052413. Lafferty, K. D., Goodman, D. and Sandoval, C.P. 2006. Restoration of breeding by snowy plovers following protection from disturbance. Biodiversity and Conservation 15:2217-2230. Nosil, P, Crespi, B., and Sandoval, C. 2002. Host-plant adaptation drives the parallel evolution of reproductive isolation. Nature:417:440-443. Sandoval, C.P. 2000. 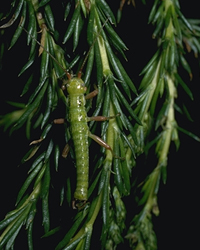 Resistance to wildfire during diapause in a walking-stick (phasmatodea, timemidae). The Southwestern Naturalist 45:123-127. Etsuko, Y. and Sandoval, C. P. 2000. Effects of mulch, water, and weeding on restoration of coastal dune plants. Restoration and Management Notes 18(1). Sandoval, C. P., Carmean D. A. and Crespi, B. J. 1998. 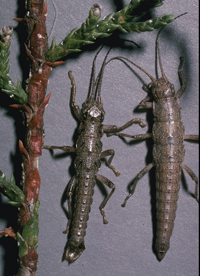 Molecular phylogenetics of sexual and parthenogenetic Timema walking-sticks. Proceedings of the Royal Society. London B 265:589-595. Sandoval, C. P. and K. D. Lafferty 1995. Invertebrate communities. pp. 39-45 In R. F. Ambrose, editor, Coastal Wetland Resources: Santa Barbara County Mainland. Final Report to the County of Santa Barbara. Sandoval. C.P. 1994. 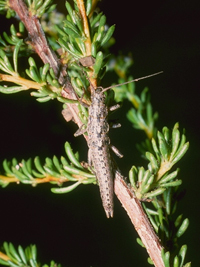 The effects of the relative scales of gene flow and selection on morph frequencies in the walking-stick Timema cristinae. Evolution 48:1866-1879. Sandoval, C.P. 1994. Plasticity in web design in the spider Parawixia bistriata : a response to temporal variation in prey type. Functional Ecology 8:701-707. Sandoval, C.P. 1994. 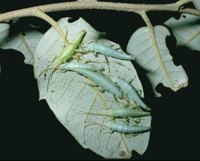 Differential visual predation on morphs of Timema cristinae (Phasmatodea, Timemidae) and its consequences for host range. Biological Journal of the Linnean Society 52 :341-356. Vickery, V.R. and Sandoval, C. P. Description of three new species of Timema (Phasmatoptera:Timematodea:Timematidae). 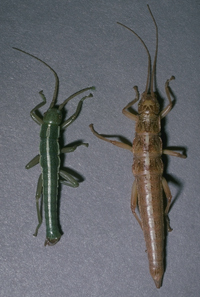 Journal of Orthoptera Research. in review. Vickery, V.R. and Sandoval, C. P. Additional notes, a change in synonymy and description of two new species of Timema Scudder (Phasmatoptera: Timematodea; Timematidae) from California. The Canadian Entomologist in press. Vickery, V.R. and Sandoval, C. P. Two new species of Timema (Phasmatoptera: Timematodea; Timematidae), one parthenogenetic, in California. The Canadian Entomologist in press. Vickery, V. R. and Sandoval, C. P. 1998. Timema monikensis, Species Nov. (Phasmatoptera: Timemmatidea: Timematidae), a new parthenogenetic species in California. Lyman Entomological Museum and Research Laboratory, Note Number 22. Sandoval, C.P. and Vickery, V.R. 1996. Timema douglasi (Phasmatoptera:Timematodea), a new parthenogenetic species from southwestern Oregon and northern California, with notes on other species. The Canadian Entomologist 128:79-84.